This quote always makes me chuckle whenever we cross paths. It sometimes resonates more than on other days, but it always finds my attention. Balance. What a beautiful, gentle, strong word. And yet so often so very fragile. When the world around us feels like it’s turned upside down, when we struggle to understand what’s going on, things can sometimes get a whole lot, leaving us stressed out, anxious and overwhelmed. Your thoughts start racing, worries start making their way through into you core, your body responds with flight or fight, or even just shuts down. When I feel overwhelmed and out of balance, all I need to do is go to our sacred oceans. I just sit in the sand and watch the waves come and go. Right then and there I am in the very here and now. Things start falling into place. I feel a deep sense of peace and space again to breathe. Even the world feels like it might actually make sense after all. Now, unfortunately I live quite far away from the sea, so I can’t just go see her and let her heal my chaos. I had to find other ways that help me return to a place of balance when I lose my stands. Here are my three most valuable essentials. When I don’t feel like doing any yoga at all, that’s when I often need it the most. I learned that. It takes practice to understand, but once you have experienced the magic of it, you will happily return. It’s not only through balancing poses that we can practice and explore our balance, it lies in every yoga pose that we do. Every pose invites us to find the balance between stability and ease. Just as in life we practice to find steadiness while staying flexible enough to change when necessary or wanted. When you feel weak, try some gentle strengthening poses. I personally love going into warrior poses. They help me focus and connect with myself and my strength so beautifully. If I notice that holding the pose is to strenuous, I change into a gentle, slow warrior flow. I keep it simple. I only use three poses and I don’t stretch as far as I may on other days. I allow my breath to guide me through my practice. Practicing giving myself physical space also helps me create space in my thoughts which in return gives me space to breathe more deeply. When you find it hard to hold your balance, use some support. Why make life complicated? Give yourself permission to use (or ask for) support. Grab a chair to gently hold on to during a pose. Use it to do a seated practice instead of struggling to find a stable and upright seat on the ground. When you feel nervous, shake it off. I don’t mean mentally, I mean actually shaking it off. Start by gently shaking your left hand and let the motion move all the way into your shoulder. Lower your arm again. Now the right hand, arm, shoulder, and lower it again. Left foot and leg. Right foot and leg. Now you bottocks. Shake it. Shake it real good. Let it turn into a full body shake. And stop. Find a good stand. Let your arms rest next to your body. If it’s okay for you, close your eyes, or find a spot a little farther away from you on the ground that holds your focus. Breathe. Notice the flow of energy through your body. With every exhale your shoulders get to relax a little more, your jaw softens. That can be it. That can be all it takes to stop your mind from racing. When we get stuck in that mind game, we often lose touch with our breath. It starts to become shallow and to travel way up high in our body. When it happens, sense this breath. Feel where it resides in this very moment and place two fingers there. It might be over your heart or in your throat. There’s no right or wrong here. Just experience what is. If you feel it more to one side, draw a line with your fingers to the middle resting them there (say on your chest bone). Now move your fingers an inch further down and breathe into your gentle touch. Stay here for three breaths, then move another inch further down. Again, lovingly direct your breath towards where your fingers reside and grant yourself three luscious breaths. Continue like this until you reach your navel or maybe even your lower belly. It’s okay if you don’t feel your breath exactly where your fingers have moved to. Just imagining it already sparks the right impulse in your brain and will help you relax. So simple. So beautiful. And so true. You can use this phrase as a little meditation, a gentle reminder, where ever you are or go. Start be having your thumb and index finger touch, and think or say peace. Now have your thumb and middle finger touch, and think or say begins. Thumb and ring finger, with. Thumb and pinkie, me. Repeat as often as it feels good and right to you. You can do this on the tram, at the office, on a walk outside in nature, or in bed at night. I hope it serves you. Check out Gabby Bernstein for more beautiful inspiration on how to return to love and peace. Just like the ocean, life has its highs and has its lows. You can’t pin the tides to the sand, and neither can you pin down a moment in life. But when we learn to go with the flow, to work with instead of against the tides, life becomes much easier and a lot more joyful. 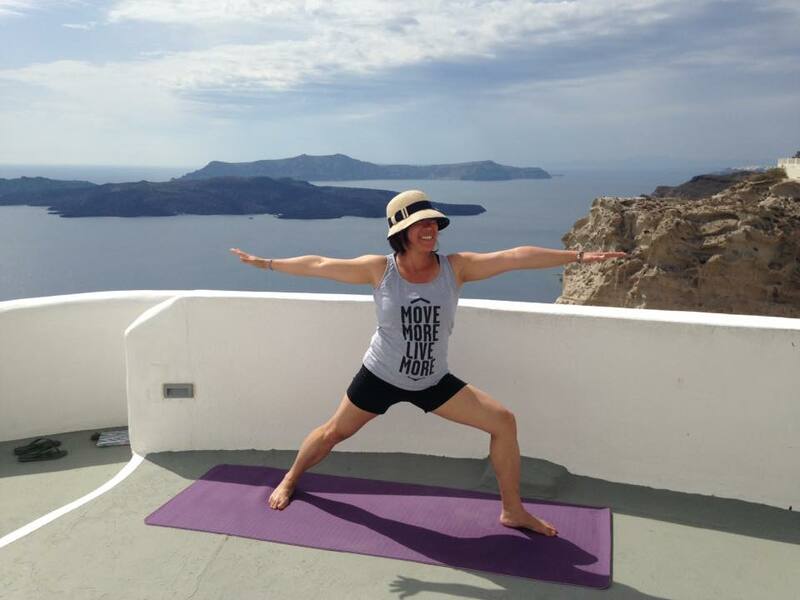 Join me this summer for our Lucia Yoga retreat with Cory from July 23rd to 28th, and explore and practice living in balance. In the meantime we would love to hear from you. What you do when you lose your balance? Leave a comment and inspire other readers with your tips and experience. Aloha, I'm Cory. Yoga teacher, breath coach, and Lomi Lomi Nui practitioner with a passion for the ocean, traveling, and brownies. Yoga has taught me how to find balance and look for the calm within myself admidst the chaos. I offer a very gentle, trauma-sensitive yoga style with a focus on tuning into your body and connecting with your breath. Thanks to my own experience I now help people tackle their fears and realize that they are their own most powerful resource.